The Mini Myth series of board books is directed at pre-schoolers. Each has a mythological character and their story with a different slant to it. Icarus is a typical want-to-do-it-all toddler. He’s anxious to explore the world around him and try new things. He’s egocentric and fearless; confident that he knows how to do everything. Although Father knows best, Icarus must be allowed to fly free; to become independent without his wings being clipped. He frequently needs reigning in and continual guidance. He must learn to listen to advice. They start making a kite together. Impatient Icarus wants it finished now. He keeps going too fast; flying it too high. Dad tries to slow him down. He encourages and protects the boy who is allowed to make mistakes so he can learn from them. They can always try again if things go wrong. At the end of the book, the myth is told in a simple and clear way. I really enjoyed exploring this beautifully presented production. It’s made of sturdy, glossy cardboard which can’t be easily torn, can be wiped clean and is safe for even very young children. Strong bold shades are used as background for the full colour pages. The character illustrations have dark outlines and expressive faces. Children can relate to the characters in every way. There are quite a few titles in this series which are ideal for curious and enquiring minds that will love to hear stories read to them about children like themselves. 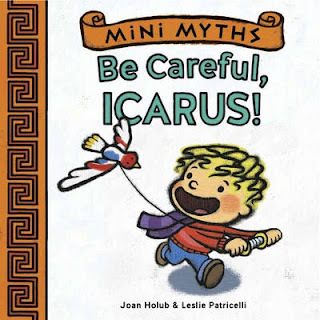 Title: Mini Myths: Be Careful, Icarus!